Cars are en route to Austin for the United States Grand Prix, and per Bernie Ecclestone, two teams are missing from the shipment: Caterham and Marussia. Only nine teams and eighteen cars will make the USGP the smallest Formula One grid since 2005. "Neither of those teams are going to go to America," said Bernie Ecclestone to Reuters. Ecclestone's Formula One Management is organizing the shipment to Austin. Since cars will be heading directly to Interlagos for the Brazilian Grand Prix, missing the shipment to Austin means it's likely for the team to miss the next grand prix as well. 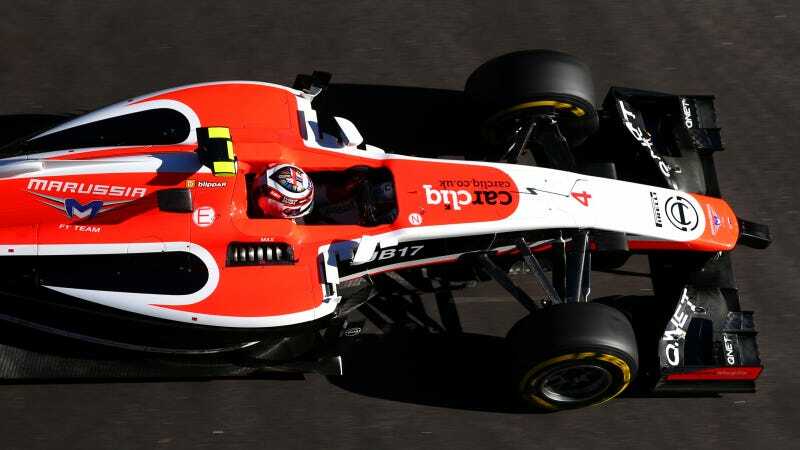 Marussia raced with only car at the Russian Grand Prix out of respect for injured driver Jules Bianchi. Marussia not making it to Austin with Caterham likely out is bad for a number of reasons. First, this means that none of the new teams that started in 2010 are at either of the next two races. HRT folded promptly in 2012, and cash-strapped Caterham and Marussia have struggled to keep up with the ever-bloated budgets of Formula One. If the sport is to grow, it needs to ensure the newest teams stay involved. This is the smallest F1 grid since the Monaco Grand Prix in 2005, where the BAR Honda team was barred for running under the minimum weight in a previous race. Ecclestone's attitude towards the shrinking grid doesn't help. In remarks made about Caterham's situation to the Sun newspaper, "I think it's better if they go." Ecclestone continued, "I don't want people going around with begging bowls." The smaller teams have been arguing for cost controls this season out of self-preservation more than anything. While I appreciate F1's dedication to fielding innovative cars, a smaller grid will certainly be less exciting to watch. As costs go up, fewer teams will be able to afford to participate. Sauber team principal frustrated by rejection of cost saving measures. Marussia is perhaps the most successful of the new teams, as they currently lead Sauber in the constructor's standings. However, they have had financial issues already this year, almost putting reserve driver Alexander Rossi in for the Belgian Grand Prix when contractual issues over Chilton's seat were in negotiation. Rossi is perhaps one of the biggest losers in this deal. A lack of an entry in Austin robs the only American driver on the grid a chance to shine in his home grand prix. F1 commentator Will Buxton is one of the few to put a positive spin on Marussia's possible withdrawal from the last two races. In a statement made on Twitter, he claims that missing the last two races before Abu Dhabi (and possibly Abu Dhabi) will allow cash-strapped Marussia to pour more resources into developing their 2015 car. No official statement has been made from the Marussia F1 Team regarding this withdrawal yet, however, it is looking more and more unlikely that they will make the grid.